The short answer is yes – that is, if you chew gum with sugar. Sugar-packed gum, a favorite among children, add unwanted low-grade calories while coating their teeth with tooth-decaying sugars. So, what about sugarless gum? Many experts say that chewing sugarless gum can actually give you whiter, cleaner teeth. Here’s how it works: The gum stimulates production of saliva and increases salivary flow. That helps to “wash” the teeth and neutralizes some of the acid produced by bacteria that feast on sugar and other food particles in your mouth. The acid, which attacks your teeth enamel, is then reduced. Xylitol, a low calorie sugar substitute in sugar-free gum, has also been shown to reduce the amount of those very same bacteria that also cause bad breath. Sugarless gum has other benefits, especially with weight gain. It has been known to help curb cravings. Studies report that popping in a piece of sugarless gum may help you from straying off your diet or indulging in unnecessary after-meal snacks. On the downside, chewing gum often can result in muscle pain and fatigue to the jaw. If you suffer from IBS (irritable bowel syndrome), then gum may not be the best thing for you. Chewing causes excess air to be swallowed, which might cause more discomfort or bloating to an already tender large intestine. I know what the next question will be. Is swallowing gum bad for you? The short answer is again yes. While it might not be detrimental to your health, introducing something into your stomach that your body can’t digest is never a good thing. 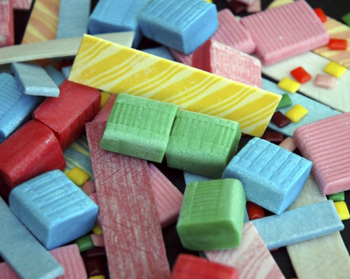 Gum is made from chewable synthetic polymers like rubber and polyethylene, mixed with a little bit of natural latex injected with flavors and sweeteners. Doesn’t sounds like something I would want in my belly! And no, gum doesn’t stay in your intestines for seven years though all my girlfriends from high school told me it was so. Does chewing gum help bad breath? Find out from the Today Show nutritionist Joy Bauer. Read on WebMD how gum helps heartburn.